THIS SWEET, creamy and wickedly aromatic risotto does away with the actual vanilla bean by generously splashing natural organic vanilla essence and double cream into full cream milk. Just off the hot stove, pair it with a minty and spicy chilled apple stew, garnished with some lusciously tart fresh berries – perfect for breakfast when family and special friends have stayed the night. To make spiced apples, bring all ingredients in saucepan to a boil before simmering covered for 15 minutes till apples are tender; turning them over every 5 minutes. Puree contents of saucepan before refrigerating, covered, overnight. To make vanilla risotto, warm 2 1/4 cups milk in a saucepan. Over medium heat, melt butter in 3rd saucepan before adding rice; stir until rice is well coated in butter. Adding 1 ladle of warm milk at a time, stir rice until it has absorbed enough milk to become almost al dente. Stir in 1/4 cup milk, double cream, sugar and vanilla essence to taste. Stir 8 coarsely chopped mint leaves through chilled pureed spiced apples. To plate individual serves, divide the hot vanilla risotto over half the mint and spiced apple puree, topping with half the blueberries and a mint sprig tip. Garnish each plate with half the raspberries and 3 mint leaves. THERE CAN be few garden plants which can boast more varieties than the sages, or Salvias. A search on line reveals countless species, and each one has a host of cultivars, in colours of red, white, or blue. Salvia gregii seems to be amongst the most prolific in this department with varieties having a colour range from white to palest mauve, blue, purple and red. There is one yellow flowered variety, S. aurea, from South Africa. 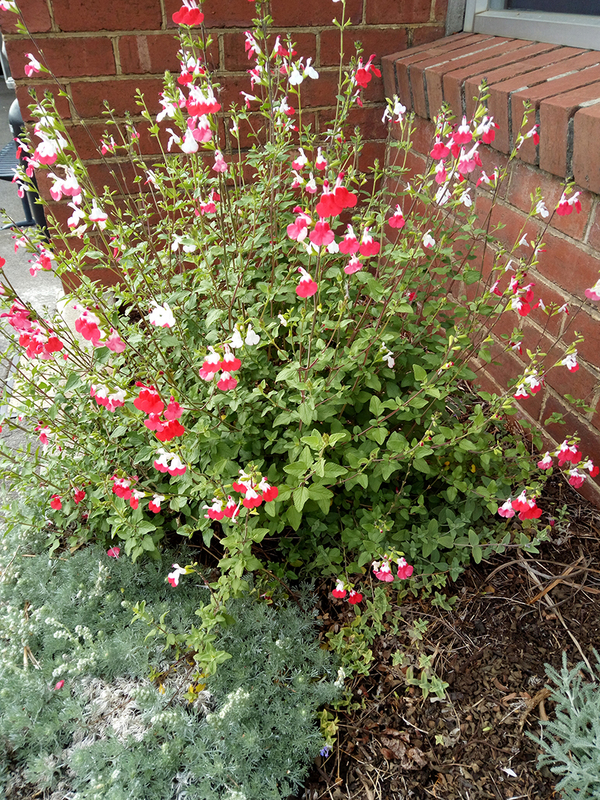 The one pictured, S. gregii ‘Hot Lips’ in the street garden at the Deloraine Commonwealth Bank, is a mixture of both white and red. These seem to do well in Deloraine, as there are some flourishing in the gardens of Grenoch in East Barrack Street. The crushed leaves of most sages have deliciously spicy scents. The red flowered S. legans (Pineapple Sage), as the common name indicates, smells of pineapples. Most sages are frost and drought resistant – except for S. uliginosa, the American Bog Sage. S. officinalis, both the green and the purple-leaved culinary sages, bear attractive spikes of blue flowers. A check with Meander Valley nurseries reveals that there is a good variety of Salvias available for sale. In the vegie garden Those who did not hear the frost warnings would have been shocked to find tomatoes, beans, and zucchinis suffering from an unusually early frost on March 13. Since then, very hot weather has returned. By the end of third week in March, only 3.4mm of rain has been recorded, and no useful rain has fallen this year. Broad beans may be sown in April, but make sure the bed is well watered before sowing. Onion seeds and spring onion seedlings can be planted over the next three months. African Marigold is thought to be a twitch suppressant. PERENNIAL PLANTS have replaced the formerly popular bedding annuals in recent times, but annuals can still have their places in the ornamental garden, particularly when weeds like twitch grass are a problem. The bed can be completely cleaned out to make room for the next crop of annuals. 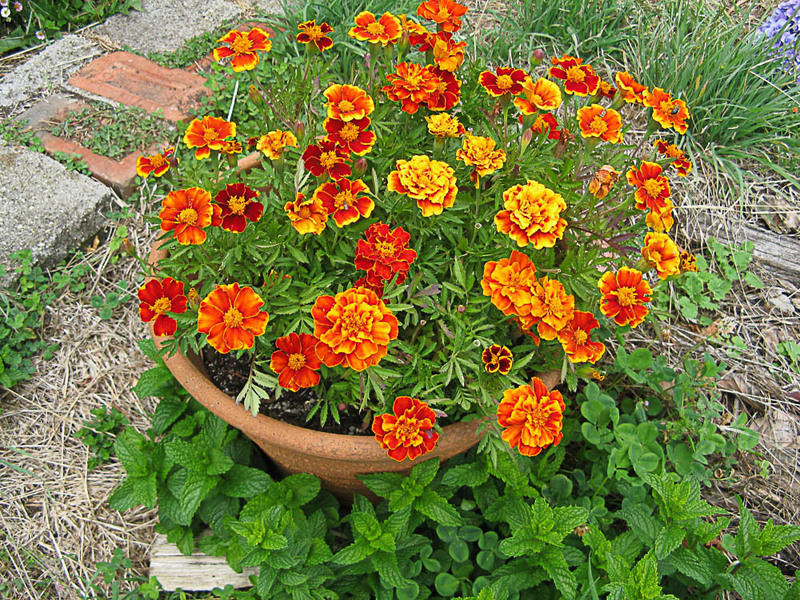 The frost and drought resistant African Marigold, Tagetes erecta (pictured), is an outstanding example - in fact, it is originally from Mexico. It is generally thought to be a twitch suppressant, but some additional research reveals that the essential oils have anti bacterial and anti microbial properties. Additionally, seeds saved germinate freely if sown in seed raising mix in punnets, and planted in the garden bed, or large display vessels when they reach 5 or 6cms. in height. Regularly dead headed, they will bloom on through late summer and into March. Leave a couple of heads until they dry out and collect the seed for sewing next Spring. All summer flowering perennials and shrubs should be dead - headed now to preserve their vigour. Leeks, which revel in the coldest weather, are an essential ingredient for hearty winter soups. Sow seeds in seed raising mix, or buy punnets of seedlings, and plant in a bed well prepared with organic matter with a mixed fertiliser added. Make holes 20cms apart with a rake handle and drop seedlings in the bottom, just covering the roots. Regular watering will slowly fill the hole with soil as the leeks grow. The bright colours of this indian style rice salad work well with the skewers of charry spiced chicken. THINK BARBECUE chicken and Israel’s street food comes vividly to mind; as do the equally delicious Indian tandoori. Marrying both’s best yields skewers of charry spiced chicken invitingly lifted by generous squeezes of caramelised lemon. With a cold rice salad winsomely wedding Kosher ingredients with South India’s… ah, perfect for anticipating first hints of autumn. 1. Mix marinade’s ingredients, 2 tbsp oil and salt together to toss with chicken cubes for refrigerating covered overnight; soaking 9 wood skewers in water for as long. 2. When ready to skewer, toss onion and capsicum slices in oil and salt; wrapping soaked skewers’ blunt ends with aluminium foil. 3. Onto each of 6 skewers, thread 4 marinated chicken cubes, interspersed with slices of 2 oiled onion and 2 oiled capsicum; piercing skewer’s sharp end into a lemon wedge. 4. Thread remaining oiled veg slices onto 3 other skewers. 5. Barbecue skewers on hot plate till meat is cooked through; charring them over open flame to liking before removing foil. 6. For rice salad, mix lemon zest and juice with turmeric to stir 3 tbsp mixture through rice to yellow them; mixing in cashews, sultanas and coriander after, and sparingly, to taste, toss in chilli flakes. MY NEIGHBOUR across the road refers to his wife as ‘dearly beloved’. This contrasts sharply with ‘ayatollah’ as a former colleague used to call his wife (what she called him is I’m afraid not printable!) After musing on this difference I wondered what other endearments might be used for our nearest and dearest, so I compiled a small list of names for him and for her, supplied by colleagues and friends. For Him: Dead Leg, The fountain of all wisdom, himself, snotty clogs, Hitler, dear one. For Her: Bossy Boots, minister for war and finance, she who must be obeyed, the clerk of works, dear heart, my little flower. If you feel so disposed the Gazette would love to hear from you with your pet name for your spouse. You may of course remain anonymous, however the Gazette cannot guarantee your safety! A CULINARY creation of the Tejano people living in Texas, Tex-Mex fuses Mexican cuisine with American ingredients including yellow cheese, beef or pork, beans, peppers, spices and the hard shell taco. Marrying US ingredients with an Australian love for sausages and local fresh produce bursting forth in warm sunny February and with Tasmania’s abundance of delicious gin, this recipe births refreshingly light tacos – the perfect summer fare assembled from delectable ingredients filling wicker baskets at our favourite picnic destinations. 1. To make sausage sauce, first soak porcini mushrooms in water for 15 minutes before chopping them up; setting aside porcini infused water. 2. In saucepan of heated canola oil, stir fry onions till tender and beginning to brown before adding garlic to stir fry till fragrant. 3. Add sausages; stir frying till all pink pork has turned white before adding porcini, mushroom infused water and beef stock cube. 4. Next add tomato ketchup, tomato paste, balsamic vinegar, dried herbs and spices; stir frying till sauce thickens; seasoning with salt. 5. Meanwhile making dressing by mixing mayonnaise, chilli sauce, gin and white vinegar. 6. To fill a tacos shell, first spoon in 2½ tbsp cooled sausage sauce before adding 1/12 of gherkins over and topping that with first 1/12 of carrots, then 1/12 of snow peas and finally 1/12 of tomatoes; drizzling over 1 tbsp dressing before garnishing with 1/12 of fresh parsley and dill. US ingredients married with an Australian love for sausages. GARDEN WRITERS are spoiled for choice for subjects at this time of year with so many perennials in their full summer regalia. The metre high yellow Coreopsis grandiflora (Tickseed) is amongst the most conspicuous of the smaller perennials. There are smaller varieties, such as the pink C.rosea, but this has shown to be more temperamental, and has not survived for very long. C.grandiflora self seeds readily, filling a bed with masses of colour in December and January. Alternatively, in winter, plants which have grown too clumpy may be divided after cutting back, and spread around. The picture was taken at the end of December. In the vegie garden Tomatoes are the most prolifically grown vegetables in our state. One local retailer said they had 20,000 plants for sale - no doubt some gardeners bought a second supply to replace those killed by the early November frosts. When the first fruit begin to develop, a tablespoon of mixed fertiliser spread around the roots, and watered in every five or six weeks will give them a boost - avoid watering the foliage. A thick mulch of straw will keep the soil moist and keep the weeds down. This dish combines juicy Australian scallops with some Vietnemese flavours and textures. AS PART OF French territories harking back to 1880, Tahiti’s closest gastronomy to a national dish, poisson cru, gives Spain’s fish ceviche a Polynesian twist – the addition of coconut milk. Unsurprisingly, this e’ia ota – Tahitian for “raw fish” - has birthed many delicious offshoots. Drawing inspiration from Chinese influences imbuing poisson cru chinois and from other cru recipes with different types of seafood, this refreshingly light ceviche infuses the juiciest scallops swimming in Australia’s January waters with some flavours and textures of Vietnamese cuisine and the freshest accents of summer while remaining true to the definitive taste of Polynesia – the perfect starter before sumptuous mains of prawns on the “barbie”. 1. ‘Cook’ scallop meat and roe lined out submerged in refrigerated plate of mixed orange and lime juices for 30 minutes; and another 30 minutes after turning slices over. 2. Meanwhile make marinade by mixing coconut cream, fish sauce and honey; stirring till honey dissolves. 3. Strain ‘cooked’ meat and roe and add to marinade; refrigerating for at least 1 hour. 4. Meanwhile mix orange zest with dill. 5. Strain out marinated scallop meat and roe. Toss in 2/3 zest and dill mixture; setting marinade aside. 6. To plate 1 individual serve: cover dinner plate with ½ Himalayan rock salt. Sit 3 upturned shells onto salt and lay ½ the parsley sprig tips on salt between shells. 7. Divide ½ the parsley leaves and flowers between the 3 shells before scooping 1/12 of scallop mixture onto each shell’s parsley. Garnish each with pomegranate seeds, crispy fried shallots and then 1 tsp marinade. 8. Heap the other 1/12 scallop mixture over this. Garnish with pomegranate seeds, fried shallots, 1 tsp marinade and finally 1/6 remaining mix of orange zest and dill. AT THIS TIME of year I’d like to share a few thoughts on temperature control. Although we wait all year for warm weather, it can be a home brewer’s hardest challenge to keep their fermenter at that magical 20° Celsius. If you are fortunate enough to have a basement with a cement floor, temperature control may not be a concern. The not-so-lucky can use a swamp/ghetto style of cooler. This is a vessel large enough to house at least the bottom third of a fermenter. Sit the fermenter in the container and almost fill it with water, then drape a wet towel or old T-shirt over it, to wick the moisture. A couple of 2 litre frozen water containers will keep the water cold – swap them out as they thaw. For a small outlay this method works surprisingly well. A dead or unplugged fridge can be used in a similar fashion without mucking around with wicking. Swap a 2 litre frozen container daily and it should keep the fermenter nice and cool. If the temperature of the FV starts to creep up, use two frozen containers or turn the fridge on for an hour or so. (Just don’t forget to turn it off again.) If you’re going on holiday and can’t be there to nurse your brew, or just can’t be bothered with the extra labour, it’s time to step up to dedicated temperature control. On your shopping list will be an old second-hand fridge (Gumtree has heaps) with a large enough space to house your fermenter. If you can find a fridge without a freezer compartment, you can reinforce a shelf and house two fermenters. Next on your list is a temperature controller from either LHBS or eBay. I use Inkbird ITC-308, which has the ability to both cool and heat (for winter) and has 2 power outlets for a fridge or heat belts. Attach the probe to the outside of your fermenter by taping insulation over it, (a cut-up stubby cooler is best.) This allows the probe to measure the temperature inside the fermenter and not the ambient temperature in the fridge. Sit the probe in a jug of water if you have two fermenters. Set the controller to 20°C and turn the fridge on. When your fermenter creeps up to 22°C, the controller will turn the fridge on until the temperature drops and then turn it off again. This uses very little power and has a cut-off safety feature. It also gives you the ability to cold crash (there’ll be more about this process in a future article) In winter, use the controller in conjunction with a heat belt. Plug the belt into the controller and hang the belt up in the fridge or wrap it around the fermenter. You don’t need the fridge plugged in for this. Over the years I have tried just about all the dark ale kits and Beermakers is the one I always go back to. This recipe turns out much nicer than a Tooheys Old and is every bit as good as White Rabbit Dark Ale, if not better. THERE ARE at least 60 garden plants listed in the Encyclopaedia Botanica owning to the common name of “rose”, when they are not members of the Rosaceae family. Among them are Lenten Rose, which correctly belongs to the extensive genus of Oriental Hellebores. The Sun Rose, which bloomed so profusely in the Commonwealth Bank Garden Deloraine, during the Craft Fair is really a Helianthemum nummularium a member of the Cistus family, and the correct name of the pretty yellow lowered shrub Rose of Sharon is Hypericum calcinum. The profusely flowering white shrub pictured here in the garden of the Great Western Tiers Visitor Centre is popularly known as a Guelder Rose. In reality, it is a member of the large Viburnum genus, several specimens of which can be found in the same garden. This is V. opulus. The yellow flowering ground cover in the foreground is a member of the huge Euphorbia family, Cypress Spurge, or E. cyperissias. A lot of confusion could be avoided by using the correct genus names of garden plants - the species name is not usually necessary. In order to avoid frost damage, December is the last month to sow cucumbers and pumpkins. If they have already been germinated in boxes under cover, then time to maturity will be much shorter. Potato tubers, celery and and sweet corn, (this in three or more short rows to facilitate pollination) should also go in this month. V. opulus or ‘Guelder Rose’. IN KEEPING with the Australian tradition of cranking up the barbie over a summery Christmas while shying away from shelling a heap of prawns, this easy to whip up refreshingly light recipe puts another Aussie seafood on the grill and goes Tassie local with what’s in season for fruit, veg and herbs. The perfect bon appétit for Yuletide entertaining. 1. Pre-heat barbecue on roast setting and brush fish fillets both sides with olive oil; seasoning. 2. Barbecue fillets on medium heat 1 to 1.5 minutes each side till lightly charred and opaque white. Then slice each into 3 and set aside covered. 3. Shallow fry till crisp the sage leaves and then the mushrooms in pre-heated canola oil. Drain the sage and mushroom chips. 4. To make sauce, stir-fry garlic and onions in melted butter over medium heat till slightly caramelised before adding wine and kunzea, cooking out the alcohol. 5. Stir in allspice, vinegar and thickened cream, thickening sauce with stick blender. 6. Add honey, seasoning with salt and pepper, and stir in the chopped dill. 7. To plate 1 individual serve, center a spiral of alternating cucumber and capsicum strips before stacking 3 segments of sole over and lightly saucing; topping stack with 5 sage chips, a nectarine slice and a sprig tip of dill, and garnishing with 6 nectarine slices, 6 mushroom chips and fresh dill. 8. Serve with remaining sauce on the side. 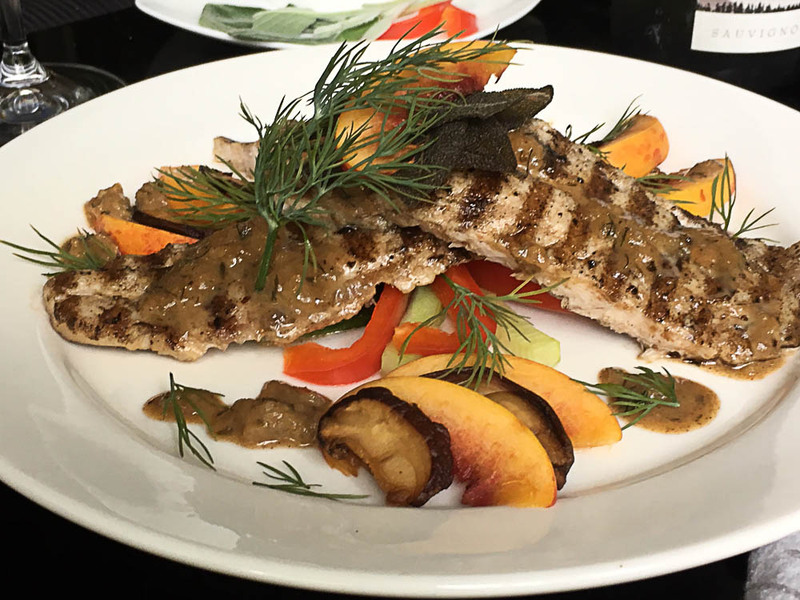 BBQ sole, an alternative to prawns for the festive season. Bruschetta puff tart, perfect for a quick meal. DRAWING INSPIRATION from the Italian Bruschetta of grilled bread topped with tomatoes, veg, cured meat or cheese, along with olive oil and salt, and marrying it to the Australian love for savoury tarts yields a speedy recipe where the puff pastry needs just one easy bake – perfect for a quick refreshing energy-packed yet deliciously nutritious lunch during another busy day in late spring! * Chosen for its intense savoury flavour and healthy pink firm texture. ** Can be swapped with any basil. *** Only real limes are used by the producer; giving a power-packed natural citrus flavour. 1. Pre-heat oven to fan-forced 190C. 2. Using blunt edge of a knife, lightly score a 1 cm border round all sides of puff pastry lying on baking paper-lined tray. 3. Lay first ham and then asparagus within the border; covering puff pastry within before brushing border with seasoned beaten egg. 4. Bake in oven for 25 to 30 minutes till pastry has crisped, puffed and browned. 5. Meanwhile toss tomatoes, olives, lettuce, chopped basil, tarragon and marjoram with olive oil, salt and pepper. 6. Top tossed mixture over asparagus baked pastry; generously shaving over with cheese, garnishing with basil sprig tips then serving immediately. DO YOU ever have one of those lazy days where all you do is lie in bed and binge your favourite television show? By “binge” I mean watch multiple episodes of a TV show straight after one another. Well, so do young people. Some may believe the stereotype and think that’s all they ever do, but there could be reasons behind this. I talked to several young people from the Meander Valley area, asking them if they have ever “binged” a show. This is what they said: “Binge watching isn’t really a thing for me... I only binge watch very rarely. Like when I’m having trouble sleeping or in a really bad mental state. Binge watching TV shows kind of takes my mind off of what’s going on in life and puts me in a better mood.” I’m sure everyone has experienced something similar to this, and we all have our own ways of dealing with emotions and anxiety. For some, watching a TV show is their way of dealing with it. It could also be considered that binge watching is healthier than taking medication to calm anxiety. Another teen said that “sometimes it’s easier to sit down and immerse yourself in a really good show than try and socialise.” A few others said that usually it’s a really good show and they just can’t, or don’t want to, stop watching. For these reasons, or others, young people binge watch TV shows. It may not let us develop social skills; however, like some young people have said, binge watching can help to calm anxiety and escape from the pressures of life. Some adults may not realise that there are deeper reasons, but hopefully you do now. Think endless days of warm sunshine and we think of coconut rather than the humble sago. Yet the starchy pearls hail from New Guinea, the Moluccas and Southeast Asia too; being extracted from piths of various tropical palms. This dessert is thus for recent returnees from pleasurably wintering in balmy parts of the Asia Pacific to the delightful Tasmanian spring – the perfect welcome home! *Available at Bridestowe Lavender Estate, Port Arthur Lavender and Tasmanian Lavender Gifts; they are dried flower buds of the ‘Munstead’ variety of the English lavender with the sweetest fragrance; creating a lovely sweet citrusy flavour in cooking. To make the lavender syrup, bring to boil lavender, water and sugar in a saucepan and simmer for 15 minutes. Strain out the lavender and simmer liquids for 20 to 30 minutes to 350ml syrup. To make the sago pudding, soak sago pearls in coconut milk and 250ml lavender syrup for 30 minutes in a pot before stirring to a boil. Continue stirring on lower heat till pearls are tenderly translucent and liquids absorbed. Spoon pudding into 4 dessert glasses to firm up covered in fridge for 1 hour. Warm covered pudding glasses in oven pre-heated to 55°C for 15 to 25 minutes. Meanwhile, toss sliced apples in lemon juice. To plate: 1 dessert glass, top ¼ of 120g nuts on pudding and 3 slices of lemon-laced apple over nuts, sprinkle ¼ of 16 g toasted coconut over, and top with 9 strawberry segments and a mint tip sprig. Serve on warmed plate garnished with more strawberries, nuts and toasted coconut. WATCHING THE Tour de France is as much about the French landscape as it is about the contest on the roads. Glimpses of the trees in the agricultural districts in their lush summer raiment make the Tour worth watching into the early hours. Although some travelling irrigators were spotted, it seems apparent that the French farmers do not use centre pivots, which spell the demise of our valuable paddock trees. It has to be admitted however, that the gentle spray from these is less drastic for the topsoil than the travellers which fling the water onto the crops, but it is sad to lose the paddock trees. One only has to see the stock sheltering in their shade on hot summer days, or huddling against them in driving rain, to understand just how useful they are on the farm. Additionally, their flowers attract birds and bees, and absorb carbon from the atmosphere to reduce the effects of climate change. It is best to use seed from the same locality, but difficult to collect from trees so far from the ground. The recent gales will have brought down some boughs. Choose grey well ripened seeds, making sure the cap at the top, the operculum, is still intact. Place them in paper bags somewhere warm, and when the seeds have fallen out, store them in the refrigerator in pill boxes. Sow in native potting mix. It should be unnecessary to remind readers that native trees should never be grown in suburban gardens where there are close neighbours. 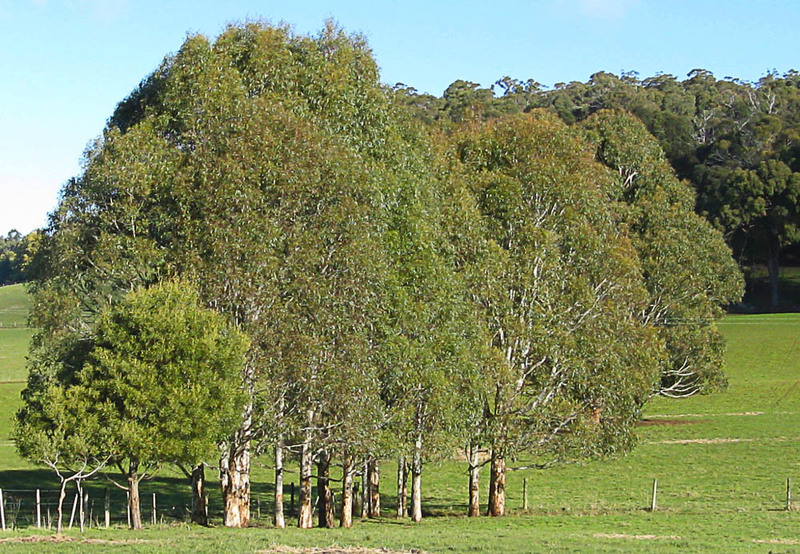 Picture shows a copse of 15 to 20 year old White Gums (Eucalyptus viminalis) and Blackwoods (Acacia melanoxylon), growing in the corner of a paddock. Broad beans can be sown in September if Autumn sowing was missed. There are very few vegetables that do not go in now, but best to wait until the soil is warmer for frost tender beans, cucumbers and zucchinis. THERE IS nothing more comforting then a roast chicken as an easy dinner; especially when there is leftover succulent meat for whipping up an aromatic and tasty broth that marries traditional western stock from roast chicken bones with age old Chinese essence of brewing and serving chicken soup, perfect for a hearty lunch that warms the soul after tending the garden on a nippy morning. *Note: Can be advance prepared and frozen, for making fresh roast chicken soup another day. To make the stock, add bones, water and vegetables into stock pot, bringing to boil. Simmer covered for 1 hour before straining out the bones and vegetables. Return clear stock to pot, seasoning with salt and pepper. Add carrots, onions, potato and mushroom to stock, bringing to boil. Over a medium flame, simmer covered for 20 minutes. Add chicken, simmering covered for another 5 minutes. Add peas and corn, simmering for a further 5 minutes before seasoning with ginseng spice. Serve hot with crusty multi-grain bread and with teriyaki sauce laced to taste with finely diced red and green bird’s eye chillies for dipping the chicken. IT IS odd to be talking about drought resistant plants in a month when rivers are running “bankers” and average rainfall to the third week in July at the Western end of the Valley, has already exceeded the historical average. At time of writing 147mm of rain has been recorded, and more is predicted. The dwarf geraniums, or Cranesbills, as distinct from the larger and more showy frost tender Pelagoniums, are tolerant of frost and many have deliciously scented foliage. The Meadow Cranesbill, G Pratense, has single flowers of purest white or pale blue, and G maculatum, the American Geranium, is reputed to have medicinal properties. Passers by will have noticed in the beds of the Commonwealth Bank in Deloraine, the bright red, deeply cut winter foliage of Geranium sanguineum, the Bloody Cranesbill, in the lower bed, while in the upper bed in the same bank the mauve flowers and green foliage of the same species are still evident. Possibly the lower bed gets more winter sunshine than the upper one, but in any case all stages of this useful ornamental plant are attractive. If the soil tends to be acid, beds destined for green peas should have been limed already. It is not advisable to sow if the soil is still very wet. Make rows 40 to 50cms. apart in loose, moist soil. Spread some seed raising mix in the bottom and press seeds into dark, damp soil 3 or 4 cms. apart. Some experts recommend sowing in cold districts in June and July, however, if there is a late frost when peas are flowering, the crop will be ruined. HAVE YOU ever realised how popular selfies have become? I searched the definition of selfie on Google and it said, “a photograph that one has taken of oneself, typically one taken with a smartphone or webcam and shared via social media.” What surprised me though is that underneath this definition was written, “Occasional selfies are acceptable, but posting a new picture of yourself every day isn’t necessary”. So my question to you as a reader is, do selfies show that people have self worth, that they are happy with who they are and how they look, or are selfies just part of a massive popularity contest where everyone says “look at me”? Or, maybe people feel that they need dozens of likes and comments in order to feel valued and loved? In today’s society, it is often difficult to distinguish the difference between what is real and what is fake. We only see what individuals want us to see through what they post. Recently, I chose to participate in a “break from the fake” where I did not go on social media for seven days. The results were worth it. By taking up this challenge I was able to focus on what was around me, instead of what was in my hand. I was able to socialise with the people right in front of me, instead of being too distracted by those elsewhere. I accomplished so many more tasks during this break without the constant pressure of social media and I thoroughly enjoyed it. I challenge and encourage YOU to give it a go and see for yourself. LEGEND HAS it that poor convent nuns in colonial Puebla created the mole for the visiting archbishop by throwing together, in panic, left over chilli peppers, spices, day-old bread, nuts and chocolate to sauce over their old turkey. Marrying the essence of this much-treasured Mexican national dish with the Australian love for a hearty beef stew yields a sumptuous mole, beautifully complemented by warm basmati rice deliciously fragranced with leafy veg and herbs; perfect for supping by the log fire. 1. Preheat oven to fan-forced 190C. 2. In large cast iron pot, dry toast chilli flakes, cumin, cinnamon and star anise over medium flame till you can smell the fragrant spices. 3. Add oil to spices to brown beef on all sides. 4. Add fennel, garlic paste, sultanas, peanut butter, chilli sauce, chocolate, butter beans and their juices, pureed tomatoes, red wine and water; bringing to a boil. 5. Bake covered pot in oven for 2h 30min. 6. After removing star anise and stirring in lemon juice, sour cream and salt, cover and serve 10 minutes later. 7. Meanwhile, stir spinach, parsley and lemon verbena into warm rice. 8. 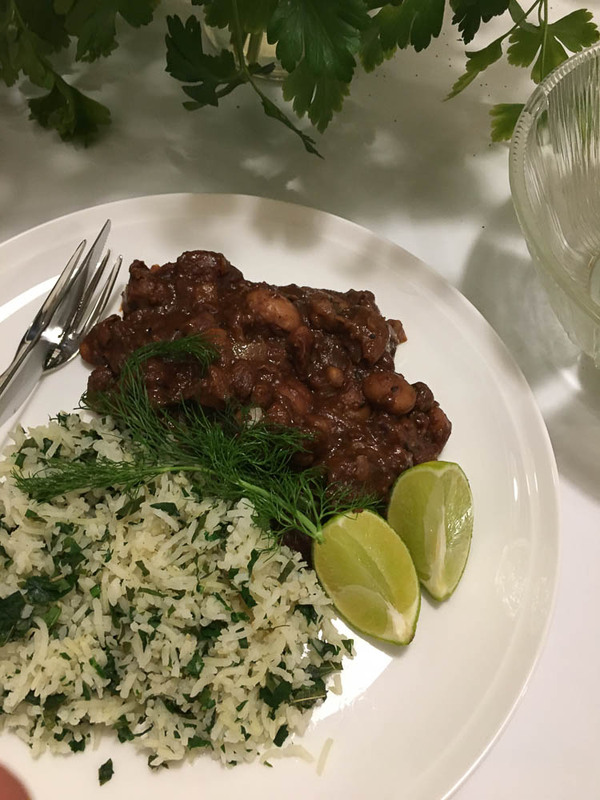 Serve beef mole and herb rice garnished with fennel fronds and slices of lime.